After being acquired by Facebook, the most popular messaging service, WhatsApp has evolved as much more than just a free texting App. It is almost impossible to stay without an internet pack loaded in your mobile network. Though this App has come a long way, but still has many WhatsApp hidden features which you may not have known so far. Here are some lesser known features that you would be interested to know. WhatsApp comes with voice and video calls. These features have been added a few months ago. The user simply needs to click the top right end within the chat window and select between `voice’ and `video’ calling options. Now sharing more media files with family and friends has become so easy. Earlier, it was restricted to 10 media files which have now increased to 30 files at one shot. Now even GIF Animated images can be shared with friends on WhatsApp. What you need to do is when you tap the emoji button; you can see a GIF icon placed next to the emoticon icon. Search for the GIFs and insert them directly. You must be tired of chit-chat on WhatsApp with this default font. So, the company has rolled out a new font. Locating your friends has become so easy with location sharing option of WhatsApp. You can simply share your exact location using Google maps. Just click on the chat windows attachment menu. However remember to turn on the locations option in your phone before sending. Now, when we talk about features, we also need to know about the most famous hacks of this mobile App. 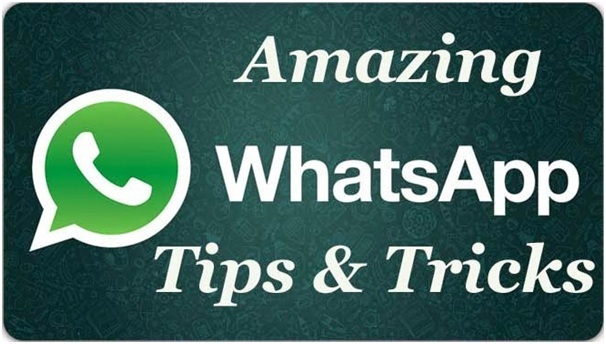 These secrets tricks of WhatsApp will certainly take you to the next level. You can make your text bold, italic and strike through. For that you need to Use (*), (_), (~) to make it bold, italics or strike respectively. Now if you want to keep an old message, you don’t have to scroll down to see your message thread. You can save that message by marking it star. If you want to preserve some important conversation, Just export it Go to Menu>More>Email Chat tabs and choose your desired email ID. No more blue ticks in WhatsApp. This hack is known as Quid Pro Quo. If you untick the read receipts available in the privacy tab, then you won’t be able to see if people have read your messages or not. Now you can read the message without showing blue tick to others. What you need to do is put your phone on airplane mode and read the message. The blue tick is visible once you are online again. Sending a giant heart is so easy!Just send the heart emoji. If you forgetful in nature, and often forget birthdays and anniversaries of your loved one, Schedule messages with Seebye Scheduler ROOT (a third party free app) and schedule your message. Blind carbon copy option allows you to send same message to multiple people. Just Click Options>New Broadcast select the name of the people you want to send message. You have the option of locking WhatsApp and secure your private conversations for both Android and iOS users. Customise your ringtones for different people. Go to custom notifications and select the ringtone. Thus, these WhatsApp features and hacks are simple to use and surely improve the users’ experience manifold.